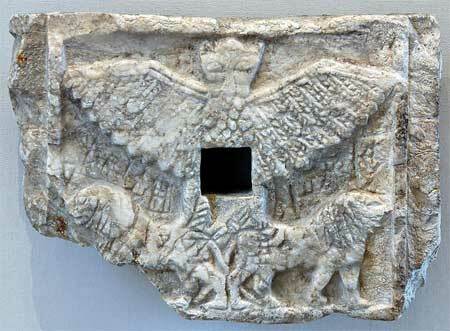 In Sumerian myth, Anzu was a large bird (eagle or vulture) who lived in the realm of the gods. In Sumerian myth, Anzu was a large bird (eagle or vulture) who lived in the realm of the gods. He was originally a benign creature, but sometime around 2000BC, stories formulated that he rebelled against the gods. The god Enlil had a number of objects that he would bestow some of his power into and which would then become a source of power for the gods (similar to the rings in Lord of the Rings). In Enlil’s case, one of his main sources of power was his insignia, which included a list of all the “destinies” he had decided his subjects would accomplish (called a Tablet of Destinies). One day while the god was bathing, he took off his insignia and the register of destinies and put it aside. Anzu, who happened to be Enlil’s guard, watched the god with envy and decided to make his move. Enlil was enraged by this action and called a meeting among all the gods to find a champion who would fight against Anzu, regain the Tablet of Destinies, and set the word right again. After a number of gods refused the task, believing it to be impossible, Ninurta agreed to the mission. Soon, a battle ensued between Ninurta and Anzu. Ninurta called upon ‘the seven winds’ and shot at him with arrows, but the great bird held the Tablet of Destinies, which deflected all attacks against him. “You, shaft that came, return to your reed thicket! Bow frame, back to your copse! Deadly silence came over the battle and conflict ceased. When that approach failed, Ninurta tried a different strategy designed to tire out the bird – he went after Anzu’s feathers, cutting them, and then pierced him with arrows. When the bird fell, he cut his throat. Anzu grew weary and in the clash of tempests shed his pinions. And cut off his pinions, detached both right and left. He (Anzu) saw his wings and emitted his utterance. And warrior Ninurta regained the Tablets of Destinies for his own hand.